Our local grocery store advertised a special on Bartlett pears recently. It’s a little late in the year to find fresh pears, but I love this aromatic fruit and purchased a basket. The memory of a unique pizza at served at California Pizza Kitchen Restaurant has always stuck with me. 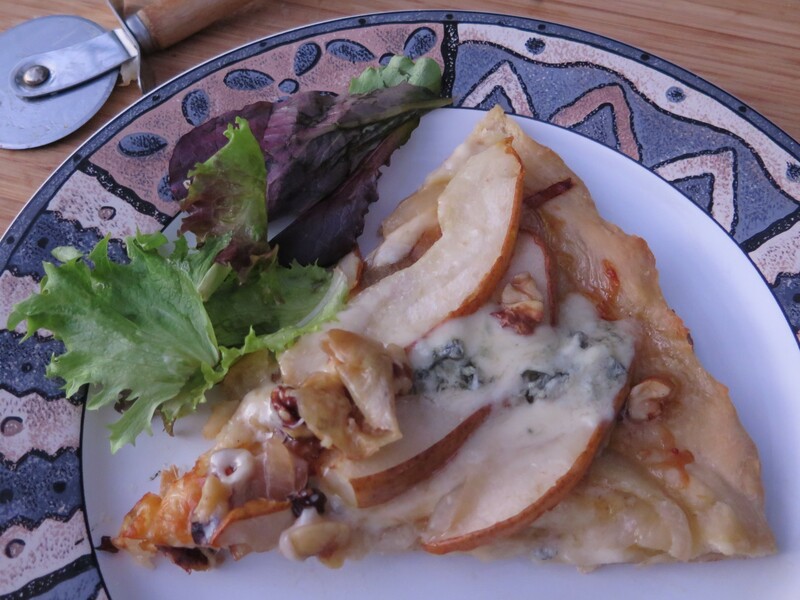 It was made with fresh pears, Gorgonzola cheese and topped with salad greens. Thought I’d try using my pears to make it. I love ripe Bartlett pears. 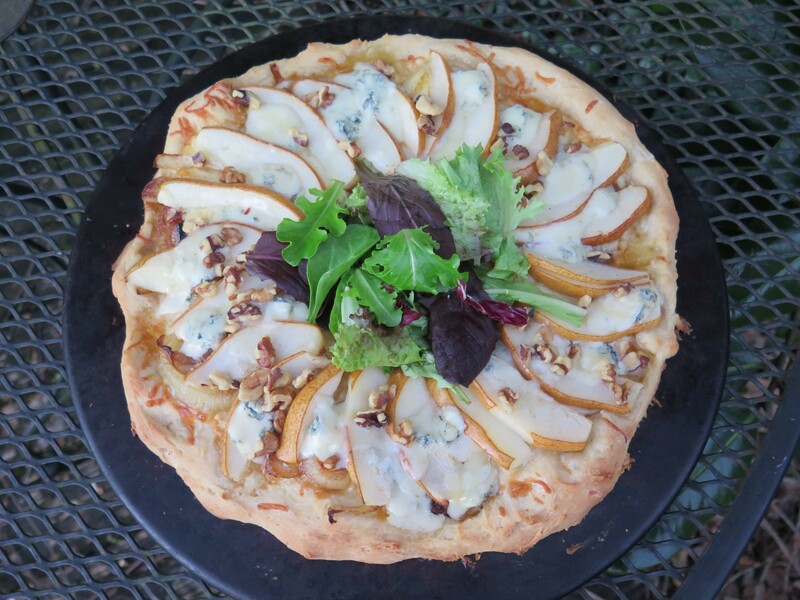 Using pears on a pizza is a little unusual; especially the combination of ingredients — pears, caramelized onions, walnuts and Gorgonzola cheese. All the ingredients all taste great individually; and in an odd way, they went together as well on the pizza. The dish at California Pizza Kitchen was served with salad greens tossed in a little vinegar and olive oil. Enough food for an entire meal. For the pizza crust, the easiest route is to purchase frozen bread dough and use this for the crust. 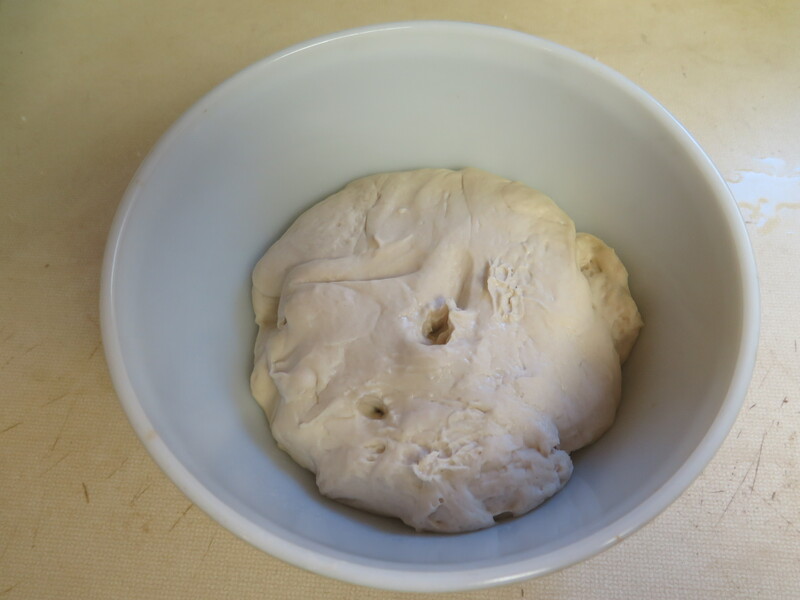 However, I decided to make my own homemade pizza crust–it is a yeast dough and isn’t that difficult to make. At one time, I made homemade pizza frequently and actually found the recipe I used for the dough. The ingredients are simple: just flour, yeast and water. I add a pinch of salt for flavor and a bit of sugar to help the yeast rise and a little oil so the dough won’t be so sticky. Just remember to check the expiration date on the yeast as old yeast really won’t rise and to find a nice warm, cozy place for the dough to rise for about an hour. For ease I make the dough in a food processor (or you could use a mixer with a dough hook). This does the work of kneading the dough and greatly simplifies the process. It saves time, you don’t have sticky dough all over your hands or kitchen counter. Put the dough in a oiled bowl with a damp cloth to cover it and place in a warm spot, letting the dough rise until double in size. This takes about an hour. For a warm spot in the winter time, I place my dough in an oven when has been pre-heated to 180 degrees. After the dough has finished rising, stretch the dough onto a pizza stone and spread on a little olive oil. 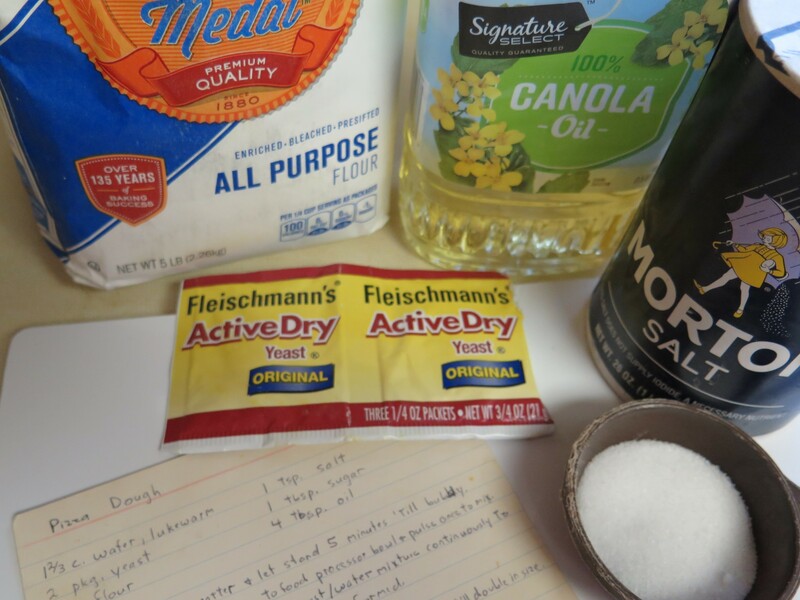 This recipe makes one thick pizza crust. Then load on the toppings. I used a blend of Italian cheeses (Provolone, Mozzarella and Parmesan), sliced onions which were caramelized by sauteing in butter until they were translucent, and 1-1/2 thinly sliced pear. After baking for about 25 minutes at 375 degrees, I added the Gorgonzola cheese, walnuts and baked a few minutes longer. Serve the pizza with salad greens tossed with a little vinegar and olive oil. The greens really set the pizza off. 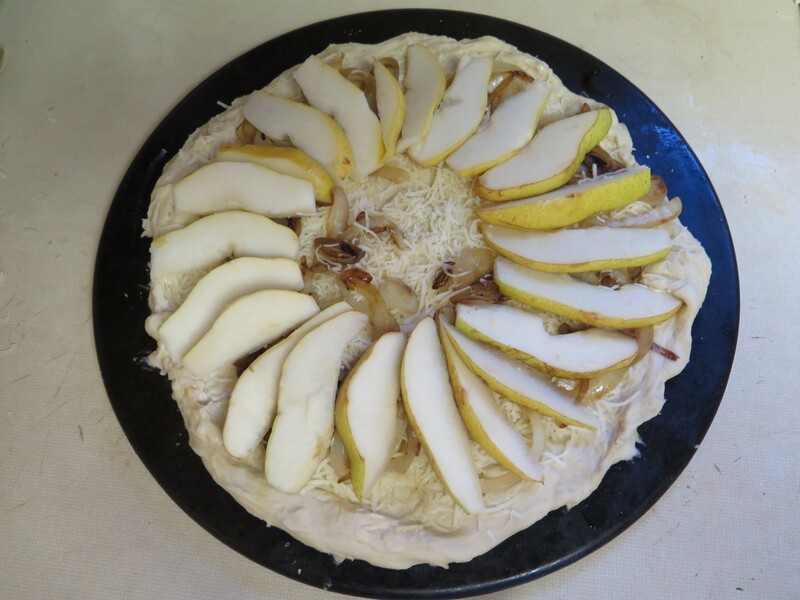 Try this delicious pizza the next time you have some extra pears. Quite unique and I’m sure you will love it like I did. Dissolve yeast in water and let set about 5 minutes until bubbly. Add flour, salt and sugar to food processor bowl and pulse once to mix. 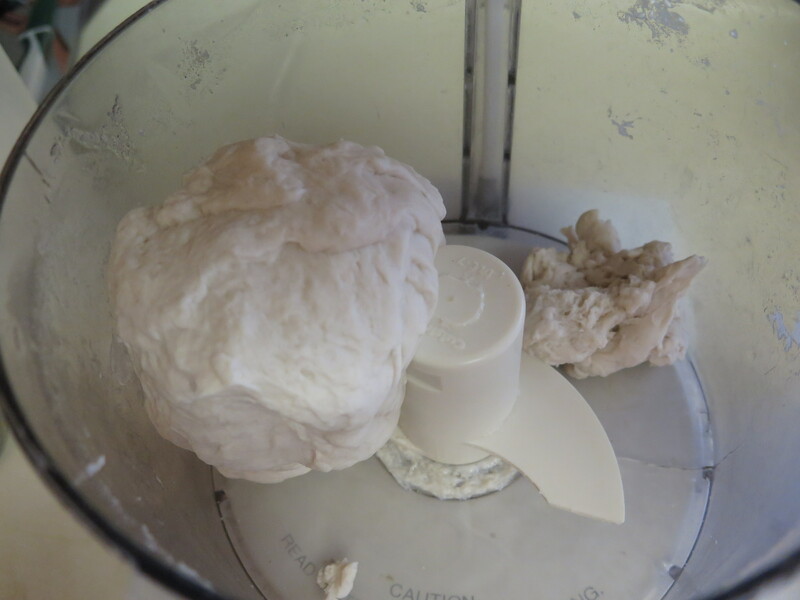 With food processor on, add yeast/water mixture continuously to four and mix until dough is formed. Add oil to dough and continue to mix. When dough forms into bowl, knead by pulsing on and off for several minutes. Alternately, knead by hand on floured board for 5 to 10 minutes. Place in oiled bowl, cover with damp towel and set in warm place. Let rise until doubled in size, about one hour. Stretch pizza dough onto a large pizza stone, 14″ in diameter. 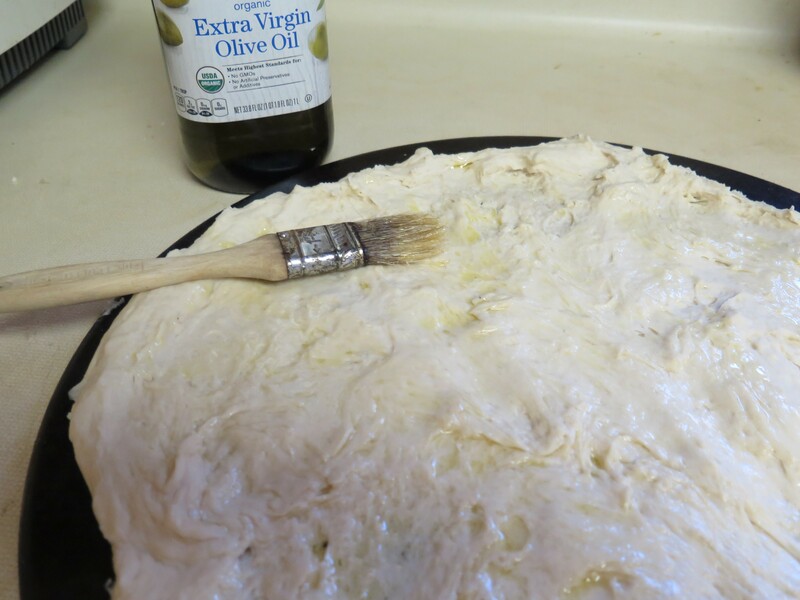 Brush 2 Tbsp olive oil onto pizza dough. Sprinkle on shredded Italian cheese blend. Slice onion into thin slices. Add 1 Tbsp olive oil to skillet, heat to medium high. Add onion slices and saute until wilted. Arrange onion on pizza. Slice Bartlett pair into thin slices, leaving skin on. Arrange in overlapping slices onto pizza dough. Bake in pre-heated oven for 25 minutes until the cheese is melted and crust is lightly browned. 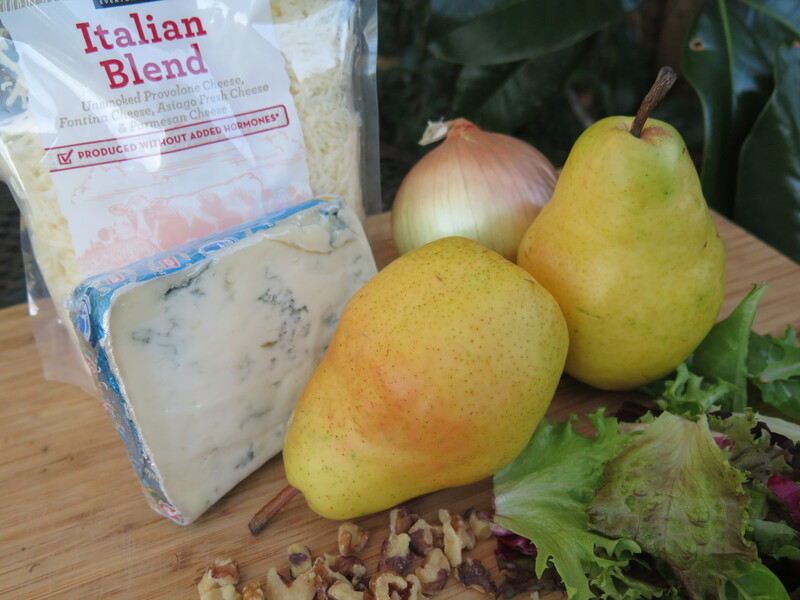 Sprinkle on crumbled Gorgonzola cheese and chopped walnuts. Bake an additional 2 to 5 minutes until cheese is melted. Remove from oven. With pizza cutter, slice into 8 slices. Combine salad green mix with vinegar and oil vinaigrette. Serve pizza slices with green salad. 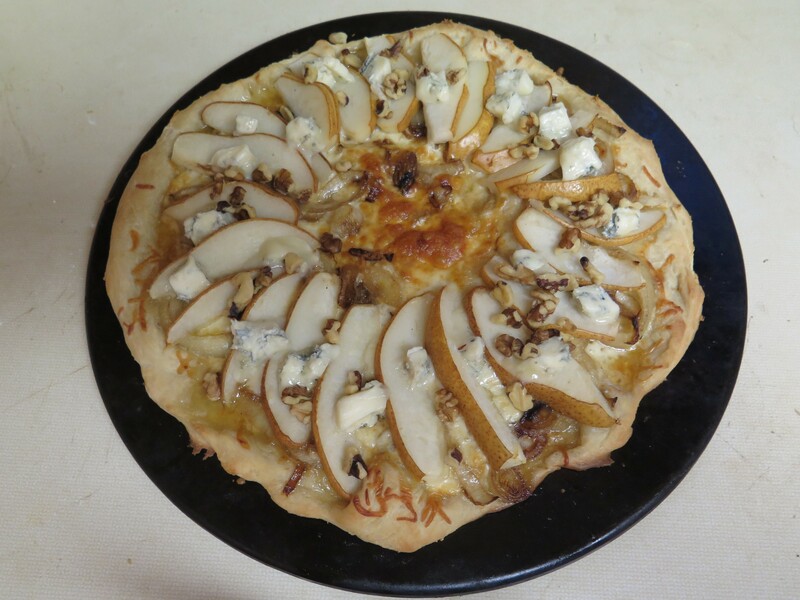 This entry was posted in Recipes and tagged Bartlett pears, California Pizza Kitchen, homemade pizza crust by Maylee at Beyond Gumbo. Bookmark the permalink. Thanks for stopping by and liking my recipe. I took a peek at your chocolate chip loaf and have to say it looks delicious, too.